Your Homework Assignment | Tennessee Aircraft Services, Inc. I hope this doesn’t come across as just another boring article about aging aircraft. You’ve had your plane inspected with great detail so what could be wrong? Actually, to ask “what could go wrong” is the perfect question. The process is to determine possible failure modes and find a solution in time to avoid a catastrophe. A “routine” inspection that expects to find the “routine” problems is likely ignoring the 800 pound gorilla sitting in the corner. Today’s 800 pound gorilla may be wing attachment bolts and pins. in which they are mounted. A slightly over zealous mechanic decided to check the movement of the wing relative to the fuselage on a 177RG during annual inspection. He discovered what he believed to be excessive wear at the attach point allowing the wings to move up and down much more than normal. Unfortunately, the mechanic couldn’t find any written guidance to support or dismiss his findings. 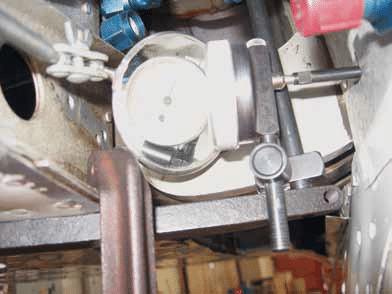 The first course of action is to measure outside diameter (OD) of the pins and the inside diameter (ID) of the bushings to determine if they were within the original limits. Removing the pins is simple enough and their OD was measured in several different places. At all points it was found within the new manufacture minimum specification of 0.8735″. 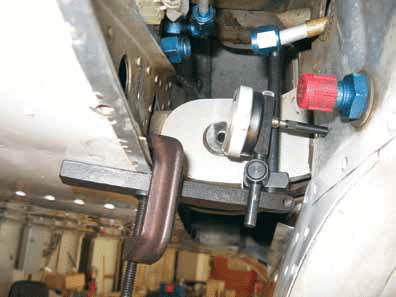 Measuring the less than one inch ID of the bushings to within 0.0001″ is not within the scope of one’s typical airplane mechanics’ tool box. Other methods must be explored. the cabin as the wing tip is raised. A dial indicator mounted to the wing root even with the lower attach pin can measure a change in distance between the wing and cabin which will yield data on the lower pins free play. With the indicator in place and the wing resting under its own weight, a reference position is set. Wing jacks are set in position and the weight of the plane is transferred from the wheels to the wings as the jacks extend. As this happens the slack in the lower attachment is taken up and the bottom of the wing moves away from the cabin. The first reading is 0.007″. Several more cycles are made with the wings and measurements taken. The bell curve results in an average movement very close to the first reading. 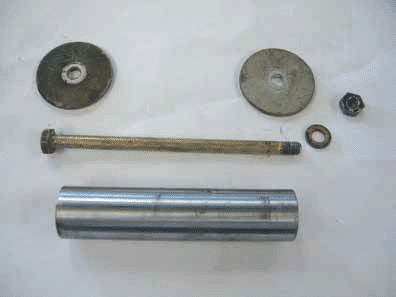 This process is repeated for the other wing with a slightly larger movement of 0.010″ found. The lower wing pin with the small retaining bolt and oversized washers. The lower pin on a 177RG has a designed diameter of 0.8740″ with a minimum of 0.8735″. 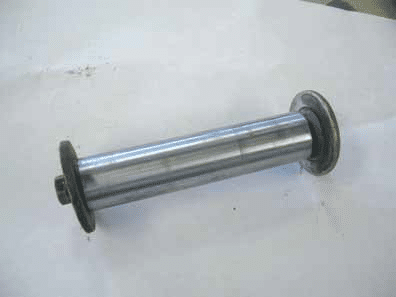 The bushing found in the wing spar carry through and the wing attach forgings are standard 4130 steel and are reamed to an inside diameter between 0.8772″ and 0.8765″. The worst case movement of the pin each bushing is the difference between the bushings’ maximum ID and the pins minimum OD yielding 0.0032″. That’s about the thickness of a sheet of note book paper. Because the pin moves in the carry through bushings and the wing attach bushings we will sum the two for a total of 0.0064″. As you can see, at 0.0070″ we have exceeded the original manufactured limit. The lower pin as it looks assembled. This doesn’t automatically mean the plane is unsafe or unairworthy. In fact, the service manuals’ total lack of mention of the fit of these pins leaves the airworthiness decision to the mechanic. It may sound strange but it’s not so different than the mechanic deciding those few little hail dents are not an airworthiness problem. The manual is equally quiet on both points. 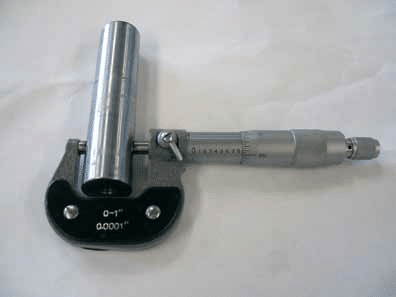 Putting the micrometer to the pin to measure diameter. So now we’re back to the conversation with Cessna in hopes of gaining some guidance. Some sort of in service wear limit would be great but that’s a pretty exposed position from a liability stand point. For now, the word is the manufacturing limits are all Cessna is willing to site. The “for now” part is the lack of information showing to what extent this problem is in the fleet. If a significant number of the fleet has the same issue then Cessna might be more inclined to pursue a fix. I don’t want to draw undue attention to a possible non-issue but I have learned it’s way better to discover a problem sooner than later. and solutions might prevent that first failure. the publication would ensure community awareness. equipped to deal with it in a timely fashion. 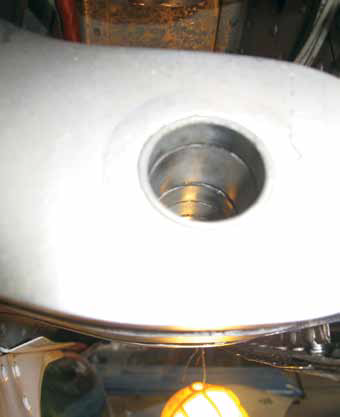 fittings are aluminum with steel bushing inserts. As a shop that sees a disproportionate number of cantilever Cessnas, I intend to measure the wing free play of every 210 and 177 that comes through my doors. The engineers at Cessna have requested I share that data with them after I’ve gathered a significant number. That leads me to your home work assignment. The next time your 177 or 210 is in the shop with the wing root fairings removed, ask your mechanic to spend an extra hour to measure your wings’ free play. Send the data to me and I’ll add it to the sampling. The information should include: date sample taken, aircraft model, aircraft serial number, total flight time on the airframe, and the measurement of each wings’ free play. The attached photos show our set up, but others may work as well. It is important that the measurement points are on the same level as the center of the attach pin. Several measurements should be taken and an average calculated. Send the results to paul@tennesseeaircraft.net with “wing pins” in the subject line. I’ll populate a spread sheet to share with everyone about this time next year. Hopefully, we’ll get some useful information back from Cessna. Lest one thinks this is just a cantilever wing issue, think again. There is only one bolt at each end of the lift strut on that 120, 140, 150, 152, 170, 172, 180, 182, 185, 205, 206, 207, and early 210 series. I don’t believe there is any immediate danger but it’s certainly worth a look. The next time your strutted wing Cessna is in the shop and the covers are off, place a finger at the lift strut attachment inside the wing. Allow your finger to touch the strut and the spar near the attach bolt. Have someone carefully push up on the outboard end of the wing and feel for movement between the strut and the spar. Do the same for the attach point at the cabin end of the strut. If there is a problem, you really want to know about it now instead of later. For the moment, our subject 177RG isn’t in any danger and the attach points have been thoroughly inspected to ensure safety. Had there been some hidden flaw discovered, we’d pat our “over zealous” mechanic on the back, call him/her a hero with thanks for averting a catastrophe. As it is he’s just forced us to begin the search for a solution to a problem that hasn’t happened yet. The more I think of it, that makes him/her an even bigger hero.